Browse: Home / Tech / Speed up Your Computer in 10 Easy Steps / Speed Up Your Computer in 10 Easy Steps… For Free! Speed Up Your Computer in 10 Easy Steps… For Free! We all experience it: head-bashing frustration because our computer runs too slow. When you click something and it takes an age to respond; or doesn’t respond at all. Where you turn on your computer and you can eat breakfast and have a shower before it has booted up. Don’t despair – it’s surprisingly simple to fix these common problems and it’s easier than you might think. Regardless of the spec of your Windows PC or laptop computer, here are ten easy steps to take that will speed up your computer and get it working as efficiently as possible. Problem: When you browse the web and use applications on your computer, countless temporary files are created on your machine. When you exit the application or finish browing the web, many of these files remain on your hard drive and over time, they can clog it up and affect the performance of your computer, slowing it down. 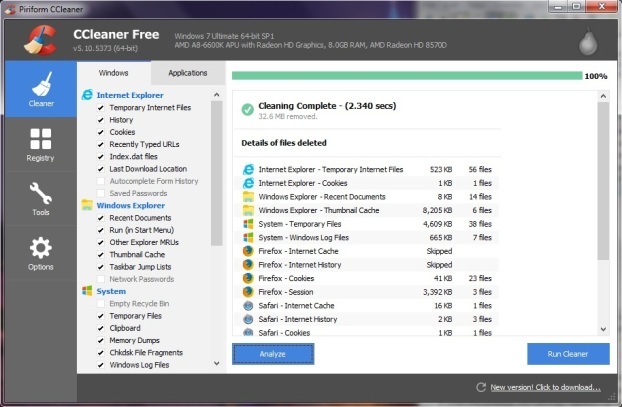 Solution: Though there are tools within Windows that can clean up these files, the easiest and most thorough way to do this is to use the fantastic free software called CCleaner. We recommend you run CCleaner once every week or two, depending how often you use your computer.